An adorable centerpeice! 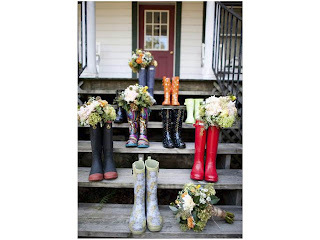 I spotted these boots on a wedding blog. The bridesmaids sported these colorful beauties and above is a shot that that a photographer snapped with their bouquets. BUT this photo got me thinking - wouldn't this make a strange, but cute centerpeice at an April bridal shower!? You can buy inexpensive boots at Target and Payless or even stock up weekly during Macy's sales (with coupons). They also double as a cute favor!